Opinion Did the truck driver in the Humboldt crash deserve his sentence? 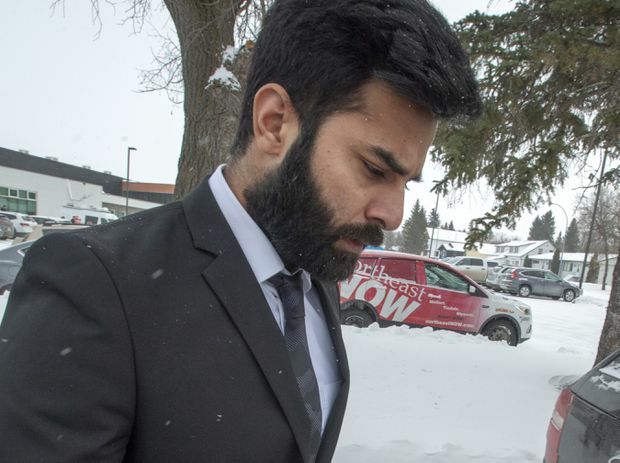 Jaskirat Singh Sidhu leaves his sentencing hearing on Jan. 31, 2019 in Melfort, Sask. A Saskatchewan court sentenced Jaskirat Singh Sidhu to eight years in prison for the catastrophic crash of his semitractor unit with the bus carrying the Humboldt Broncos hockey team. The sentence comes after Mr. Sidhu pled guilty to 16 counts of dangerous driving causing death and 13 counts of dangerous driving causing bodily harm. A case of this many counts and this much harm arising out of a single accident has little precedent. With 16 lives lost and 13 people still trying to heal from life-altering injuries, the victims and their families will suffer more consequences than can be counted for the rest of their lives. In this light, perhaps it makes sense that the sentence imposed far exceeds any other case involving similar conduct, as the judge quite squarely acknowledges. But we must ask whether it is appropriate for the harm caused by this offence to overwhelm other relevant factors. The Criminal Code says a sentence must be “proportionate to the gravity of the offence and the degree of responsibility of the offender.” The analysis of gravity properly includes harm, but a sentence must also reflect an offender’s degree of responsibility. The criminal law is strongly oriented around the idea of intentional wrongdoing. While the civil law focuses on compensation for loss, criminal law tends to focus on the question of the guilty mind. The stakes for criminal defendants are very high, such that we tend to require clear evidence that an accused intended their crime before we will convict and imprison. There are exceptions to that, of course, and dangerous driving is one such case. This offence does not require that an accused intended an outcome or even knowingly took a risk. However, even here, a criminal sanction requires more than mere negligence. Conviction can only follow where the manner of driving is a “marked departure” from the standard of care of a reasonable driver. The sentencing judge accepted that Mr. Sidhu did not commit this offence intentionally. Mr. Sidhu was distracted by the tarps and trailers on his unit before the accident. He did not run the stop sign deliberately to save time. Alcohol and drugs were not a factor and he was not distracted by a cellphone. Those facts separate him from the most culpable dangerous drivers on our roads, though Mr. Sidhu was a professional driver operating a dangerous vehicle, which mandated extra care and attention. Mr. Sidhu entered a guilty plea, which is important to sentencing for three reasons. First, the guilty plea came at the earliest opportunity, sparing a traumatized community the additional anguish of a trial or other pretrial proceedings. Second, the guilty plea signals Mr. Sidhu’s evident remorse and a very low likelihood of reoffending. Third, Mr. Sidhu gave up any chance of acquittal. He did have some chance at the outset because the Supreme Court has held that a “momentary lapse of attention” cannot ground liability for dangerous driving. Now, the judge concluded that this was a “prolonged period of inattention” rather than a “momentary lapse,” because Mr. Sidhu missed four warning signs before missing the stop sign. Mr. Sidhu’s guilty plea remains more significant than the many guilty pleas offered in cases where defendants have no arguable case. It is also relevant that Mr. Sidhu will be deported when he finishes serving his sentence. This is a serious additional consequence that the Supreme Court has said is a factor that bears upon the severity of a sentence. In the 2017 Lavoie case from the same level of Saskatchewan court, a professional driver operating a semitractor missed six warning signs leading up to a construction zone. Three people died and one was injured. The driver, who pled guilty and had a 2001 conviction for impaired driving, was travelling 84 km/h in a 60 km/h zone. He said he went on “auto pilot” and missed the signs. Mr. Lavoie received three years and faced no immigration consequences. The number of victims in Mr. Sidhu’s case makes it tragically unique. For that reason, many expected to see a sentence at the high end of the typical range of 14 months to four years for this manner of dangerous driving. The question is whether the highly publicized and terrible harms in this case should attract a punishment so far beyond what other dangerous but sober drivers have received for similar conduct. The judge also cited the need for deterrence, to stop the “carnage on our highways.” One wonders if hearing the facts of this case alone already sent the strongest possible message to keep our eyes on the road.